The bridge is a tutorial on a subject this government has flunked -- economics, which is mostly about incentives. At the Pennsylvania end of the bridge, cigarette shops cluster: New Jersey's per-pack tax is double Pennsylvania's. In late afternoon, Gov. Chris Christie says, the bridge is congested with New Jersey government employees heading home to Pennsylvania, where the income tax rate is 3 percent, compared to New Jersey's top rate of 9 percent. There are 700,000 more Democrats than Republicans in New Jersey, but in November Christie flattened the Democratic incumbent, Jon Corzine. Christie is built like a burly baseball catcher, and since his inauguration just 13 weeks ago, he has earned the name of the local minor league team -- the Trenton Thunder. He inherited a $2.2 billion deficit, and next year's projected deficit of $10.7 billion is, relative to the state's $29.3 billion budget, the nation's worst. Democrats, with the verbal tic -- "Tax the rich!" -- that passes for progressive thinking, demanded that he reinstate the "millionaire's tax," which hit "millionaires" earning $400,000 until it expired Dec. 31. Instead, Christie noted that between 2004 and 2008 there was a net outflow of $70 billion in wealth as "the rich," including small businesses, fled. And he said previous administrations had "raised taxes 115 times in the last eight years alone." So he closed the $2.2 billion gap by accepting 375 of 378 suggested spending freezes and cuts. In two weeks. By executive actions. In eight weeks he cut $13 billion -- $232 million a day, $9 million an hour. Now comes the hard part. Government employees' health benefits are, he says, "41 percent more expensive" than those of the average Fortune 500 company. Without changes in current law, "spending will have increased 322 percent in 20 years -- over 16 percent a year." There is, he says, a connection between the state being No. 1 in total tax burden and being No. 1 in the proportion of college students who, after graduating, leave the state. Partly to pay for teachers' benefits -- most contribute nothing to pay for their health insurance -- property taxes have increased 70 percent in 10 years, to an average annual cost to homeowners of $7,281. 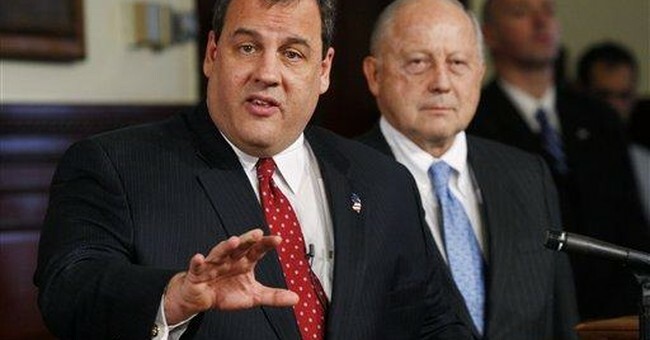 Christie proposes a 2.5 percent cap on annual increases. New Jersey's governors are the nation's strongest -- American Caesars, really -- who can veto line items and even rewrite legislative language. Christie is using his power to remind New Jersey that wealth goes where it is welcome and stays where it is well-treated. Prosperous states are practicing, at the expense of slow learners like New Jersey, "entrepreneurial federalism" -- competing to have the most enticing business climate. Christies predecessor addressed a huge unionized rally of public employees, vowing to "fight for a fair contract." Who was he going to fight? The negotiator across the table would be ... himself. Saying "subtlety is not going to win this fight," Christie notes that New Jersey's police officers, the nation's highest paid, can retire after 25 years at 65 percent of their highest salary. In the state that has the nation's fourth-highest percentage (66) of public employees who are unionized, he has joined the struggle that will dominate the nation's domestic policymaking in this decade -- the struggle to break the ruinous collaboration between elected officials and unionized state and local workers whose affections the officials purchase with taxpayers' money.